Experiments on appearance it is better to virtual, especially when technical resources allow us to do this quickly and free. 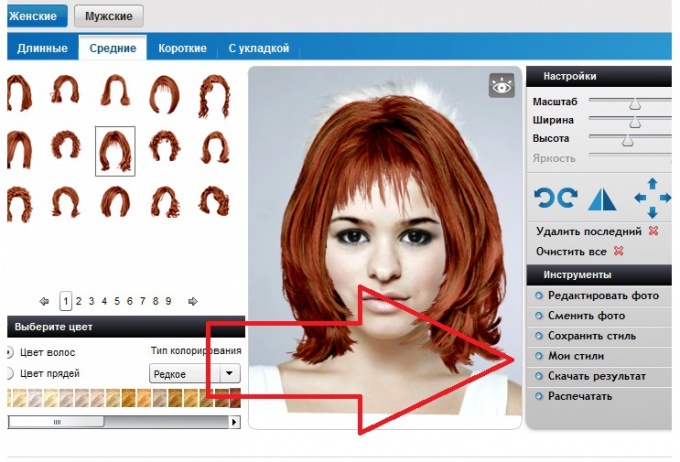 Using our online service "the Virtual salon", you'll easily be able to pick your desired hairstyle and color hair. 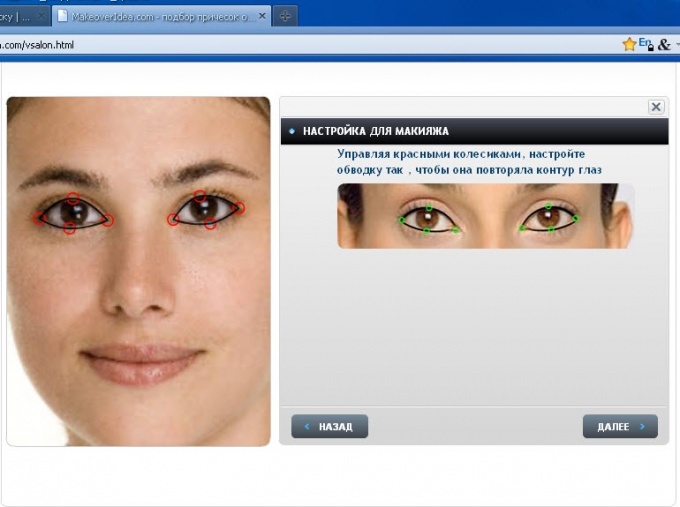 Before you open in your browser a page where you will be able to experiment with his looks, make sure that the computer was your photo is of good quality, which will be clearly visible facial features. 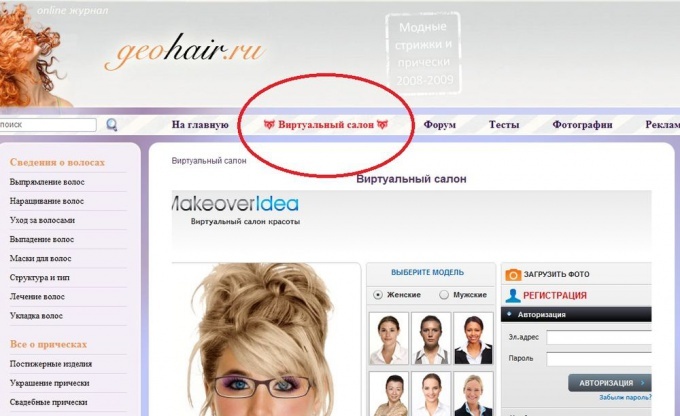 When a photo is found, unable to access the website www.geohair.ru and go to "Virtual salon". Specify a model (male or female) and click "Upload photo" to select the prepared. After downloading photos, you will need to set the pointers to the center of the pupils. Here you can adjust the color of photographs. To proceed to the next step, click "Next". Now you need to adjust the position of the pupils, the eyes and lips. Place the green arrows on the corners of the eyes, and blue – at the corners of the lips. Correct position of the pupils and click "Next". The next step is to adjust the contours of the eyes. Moving the wheels set the stroke and click "Next". After that, follow the same procedure for the lips and click the "Next"button. Only now you will be able to choose from dozens of hairstyles. You will be able to choose hairstyles short, long, medium, styling, experiment with hair color, coloring, etc. Using the zoom tools you can just pick a size hairstyles. Changeable fashion requires of women, attention to new trends in haircut and makeup. And if the makeup you can experiment quite freely, the change in hairstyle - a serious step towards a new way, which may not always be successful. To rectify the consequences of such a change is sometimes very difficult, will take time and additional costs. This problem can be solved by the program selection of hairstyles online, also provide some services. Free to choose hairstyle photo , you can contact websites with a similar theme. Upload your photo removed to smooth the hair the hair by clicking on the button "upload a photo".In the opened window, adjust the pointers of the eye, aligning them with the center of the pupils in the photograph. To continue, click Next. 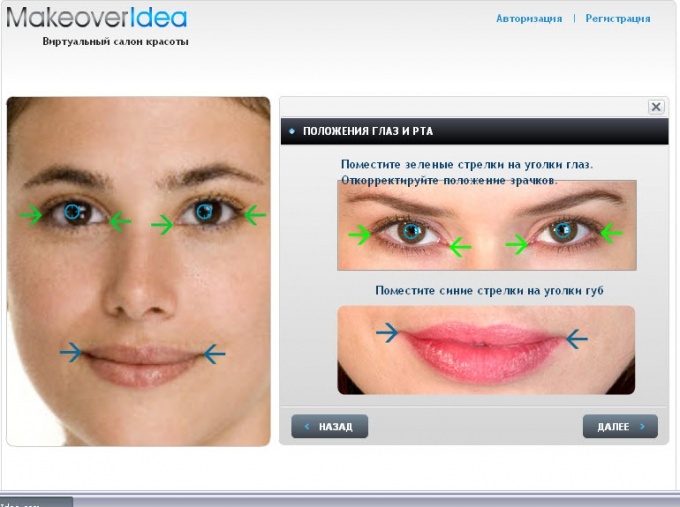 Position the arrow pointers in the corners of the lips and eyes, to determine the exact parameters. In the next window, using circles, draw the outline of the eye contour. Just repeat the contour of the lips with the help of special signs. Select from the options different types of haircuts and hairstyles that are most appropriate to your complexion and face shape. Here you will be able to choose the hair length and hair color, the shade of the strands and the complexity of installation. 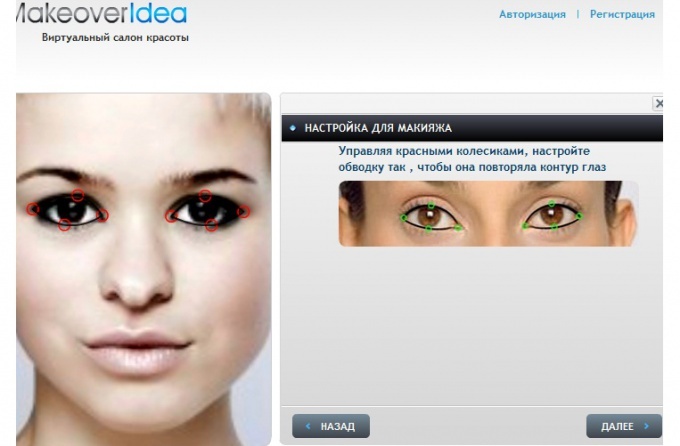 Choose makeup for free, you can using the image you created by clicking on the tab "Makeup". The Internet offers many opportunities for lovers of customization for the sake of fashion trends. 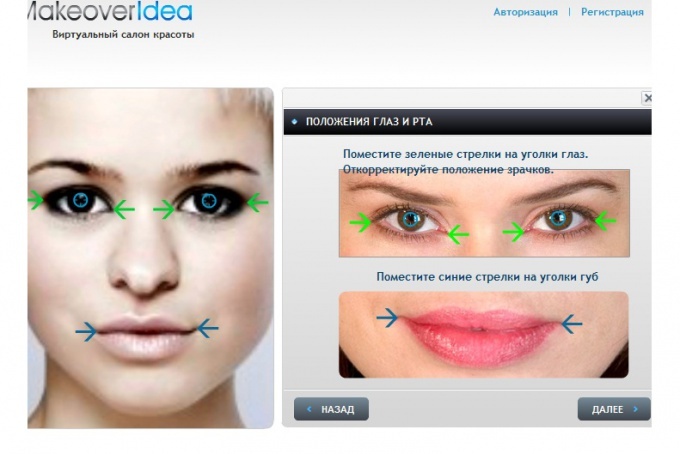 Image change is a serious step and before you decide even the most minor changes, it is better to use special resources that provide the opportunity to experiment with looks and choose the most suitable option in the virtual space. And only then to implement it in practice, eliminating the risk of failed incarnations. For example, to choose yourself the hairstyle, with help of the program, you will be able for length and volume, and try various options of hair colors. 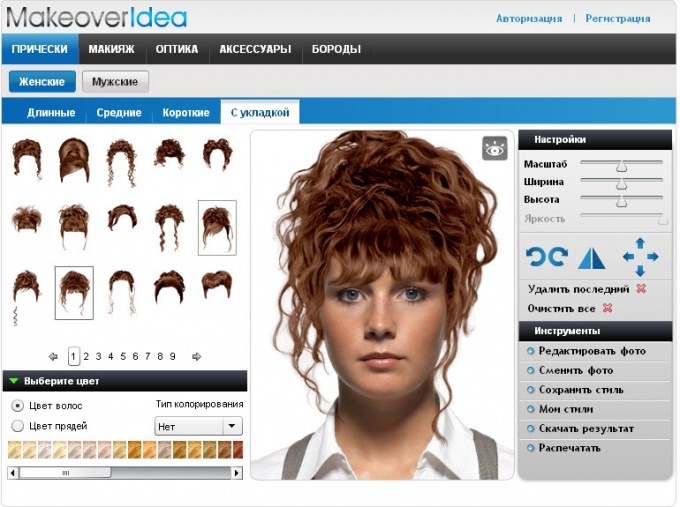 Selection of hairstyles online, consider the example of one such program. Prepare your photo with removed hair. Load it into the program, clicking "upload photos". To use advanced features you will need to register or login if you are already registered in the system. Following the instructions of the program settings, select the appropriate length of hair, amount of hair, and hair color. By choosing the coloring, decide on the type (intensity and location) and color strands. Download the result of your experiments or print, using the offered service capabilities. The resulting image you will be able to further edit the program or to show to his master, who can bring to life your idea of the most successful for you hair. The specified program you can use for the selection of hairstyles for free by clicking the link at the end of the article. But the program has a paywall, opening up more opportunities for change of image. This additional hair colors, makeup options, etc. The program allows you to choose the hairstyle and also offers the service of selecting makeup. As a result, you can completely change your image, selecting the most suitable option. For the selection of hairstyles there are special programs. 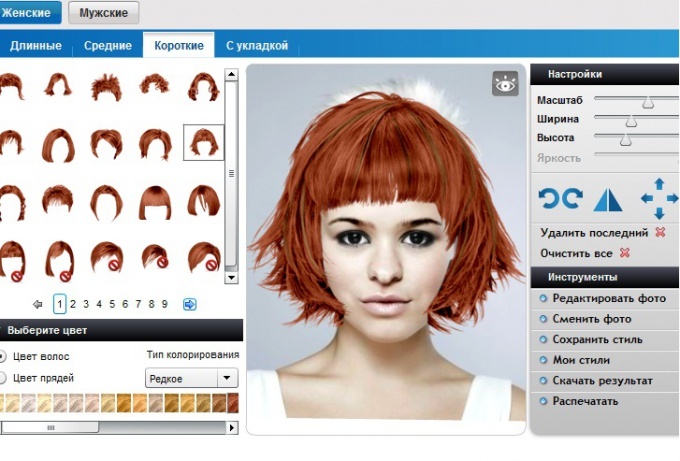 They represent a catalogue of haircuts, the user simply upload your photo, and you can start to experiment with styles. On the Internet there are also resources that offers to try on various images. 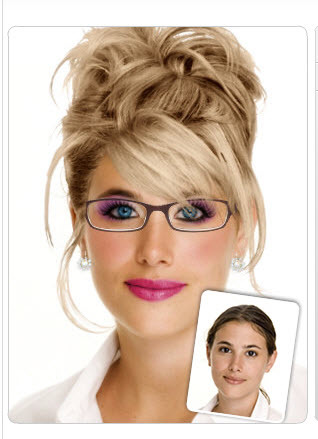 If not installed on your computer the appropriate program, you can select hair in Adobe Photoshop. -collection hairstyles or brush set. To make a graphic editor kind of image Studio, you must ensure that on hand all the necessary materials. Scan or download on the computer your picture in front. It should be quite clear, in addition, it is desirable that your own hair was collected. Curls behind the neck can damage the picture when selecting short hairstyles and bangs will not try images in which a person openly as possible. On your computer must be quite the collection of hairstyles. You can find ready-made collections, which hairstyles are on separate transparent layers, you can load the brush in different haircuts, and it is possible to make the templates by processing the vending photos. To further make it easier to pick up the image, make sure that the chosen hairstyle of the same size and the same proportions with your face in the uploaded photo. Start Adobe Photoshop and open your photo. Insert a document your hairstyle or draw its corresponding brush. Using the tools of the program, move the hair in the right place. If necessary, adjust the size of the head size or hairstyle. So the image is not distorted, while scaling hold down the Shift key. When selecting a hairstyle would work best with layers that at any time you can hide or delete. Selection of hair in Photoshop, unfortunately, can only indicate the direction in which it would be possible to change the image, but guarantees the perfect image, he does not. The fact that the structure of hair all people are different, and the color of hair, approached the editor, life may not meet expectations. Static flat picture can not convey all the pros and cons of the selected cuts, while a professional hairdresser will not only take into account face shape, features, hair, skin color and eyes, but also give useful recommendations on hair care. Modern women have a great opportunity to put together a look on the computer for free. There are special Internet sites that help in choosing a hairstyle for photos. 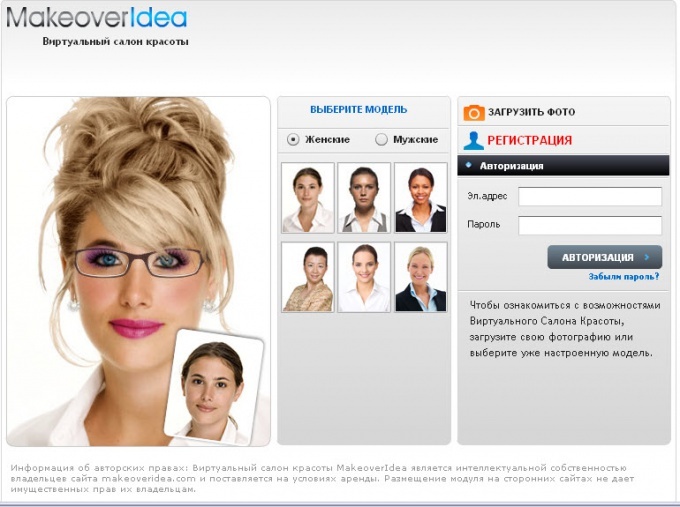 You can choose a hairstyle on your computer for free using the Virtual Makeover. Open this website in browser and then click "go to virtual salon". Previously you might undergo a quick registration, which will provide additional opportunities. However, registration is not required, and to choose the right makeup or hairstyle and without her. Upload a personal photo to the site or select one of the models in the library website that matches your face type. Click "Upload photos", enter the path to the image on your computer and click "Open". It is desirable that the pics were high resolution and quality. The best option – a photo made to any document or similar to it. Select the scale image option in the left window with the photo loaded, the label on the pupils. Drag the label using the mouse. If necessary, edit the colors in your photo using sliders that are under the window with preview. Click "Next". Adjust the position of the eyes and lips in the photo. On this screen, the person in the photo will be presented on a larger scale. Adjust the position of the marks on the eyes and special arrows mark the corners of the mouth. Click "Next". On the next screen you will be prompted to set the makeup. For this position the line of the stroke so that it matches the contour of the eye. After configuring, proceed to the next step where you will need to configure the contour of the lips by dragging anchor points. 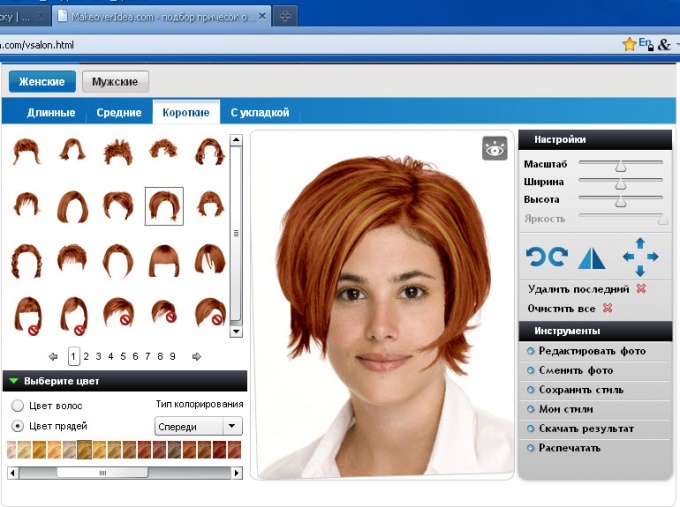 Going to the next window, you will finally be able to complete the process and free pick a hairstyle for computer. Choose male or female style and choose a hairstyle from the list. You can choose models with short, medium or long hair. You can also choose the color of hair and strands. Just hover over the color Swatch and you will see his name. 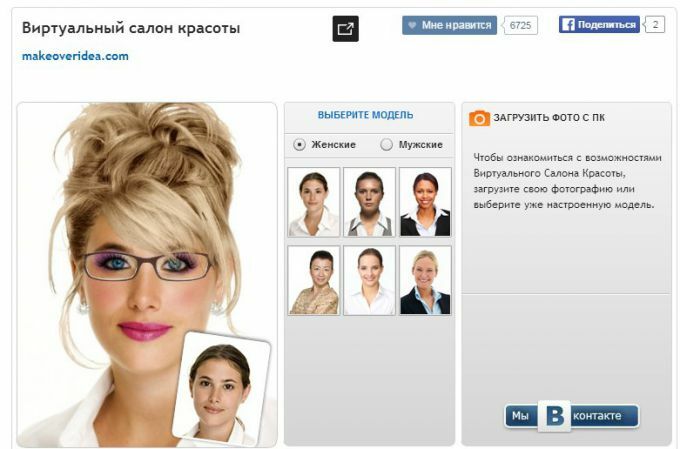 The selected hair style will be applied to your photo. Using the sliders located on the right side of the window, you can customize the pattern to fit the dimensions of the face. Save the result. If you have registered, you can save your own styles for later editing. Otherwise, just upload a picture with big hair on computer by selecting "Download results". Take a few photos in the profile, different bringing or removing the camera. This will help you better to consider suitable hairstyles through the program from different angles. To change the appearance can be different through the selection of clothes, change of hairstyle. I identified myself to several programs. First, I would like to tell you about "Cool Transformation". It's not just a change of appearance, this photo collage, transfer into another era, dimension to the tale. I usually go on mail.ru in "My World" in the "Games" section. 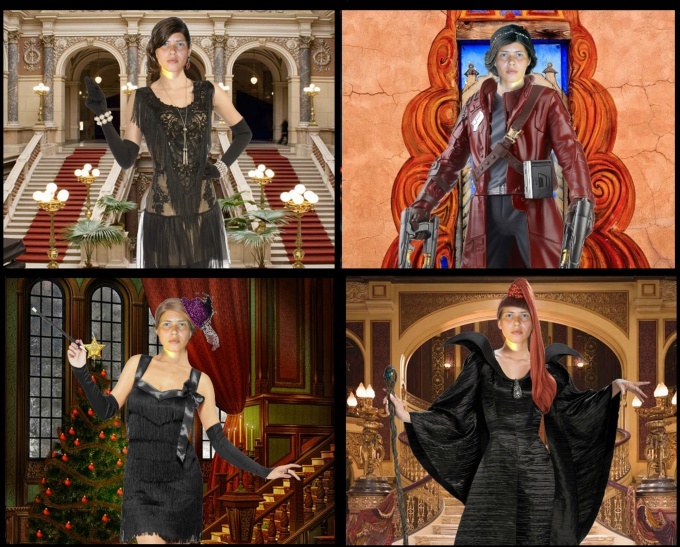 Then it's simple: upload your photo 3*4, adjust the size using the arrows, choose a background, hair and clothes: womens, fantasy, retro. You can also move the hair and clothing, holding down the mouse, change the size, hold the Shift key: up - enter — the object decreases, down increases. The outline of the clothing or hairstyles then is highlighted in green. You can also make a Christmas card using the new "Background" or "Frame": go to menu "Correction-plug-ins-Framework/elements" and choose a frame "New Year". We were pleasantly surprised that there are layers to position the elements of the frame, clothes, hairstyle. For example, new year frame with Santa Claus on reindeer needs to be behind the man. Click "Correction/Plugins-Layers/elements", select "Frame" and click the Down button. Changing the hairstyle and makeup for http://www.dailymakeover.com/games-apps/games/ — based on the hairstyle and makeup of celebrities. Go to the "Photos" choose the photo without the background (3*4). To change the appearance can be different through the selection of clothes, change of hairstyle. 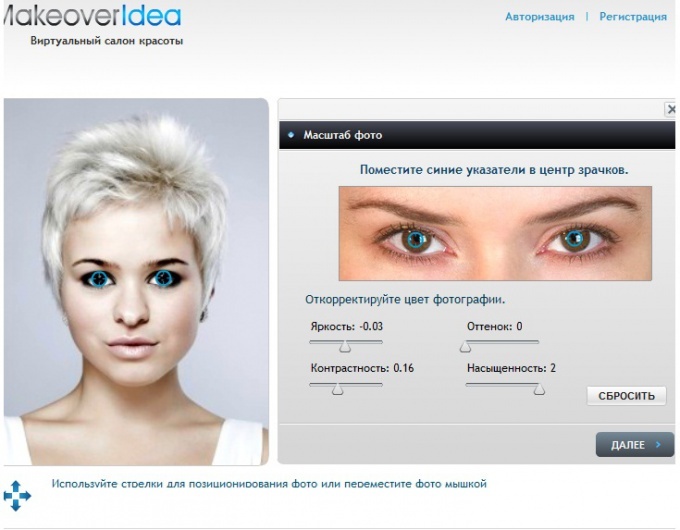 Probably the best program for the selection of hairstyles and makeup - TAAZ at http://www.taaz.com/virtual-makeover. It is possible to drag the outline for the hair, due to which the hair adheres exactly to edit the contours of the eyes and lips, so the makeup looks natural. "Evason photoshop" is an original service that allows you to manipulate photos without installing a program and abstruse lessons. It is only necessary to open the website, select the processing method and upload a photo from your computer. Will this service replace photoshop and what are its limitations? First you need to upload a photo and try to increase its contrast, saturation, and brightness to perfection, all these opportunities are available in the tab "Main". It is convenient to use the button "Automatic correction" - all these parameters will pick up the computer. You can also fix red eye — you just have to click on the red area in the pupil and it will become black. In the "Effects" you can make the background more interesting. To do this, click on "advanced settings", choose "Area of picture and a brush to paint the part of the photo to which you want to apply the effect. Looks good especially the effect of "Bronze" or "Sepia" (aging), "Pop art" black and white photo. In the tab "Registration", the user has the option to add bright colored stickers. Along with the traditional hats and sunglasses in the collection "Evason photoshop" there are snowflakes, gifts, hearts, lipstick traces. Funtion "Insert face" or "Funny cards" is so limited that it is not even worth mentioning. How to improve complexion , Evason photoshop"
You can draw or write text, and the color of the brush can be copied from photographs, so it was combined with a picture. If you first select the skin color, then choose a small brush and zoom in, we can paint pimples, moles and other unwanted defects. Unlike the original photoshop, there is no possibility to change the opacity and "fluffy" brushes. Nice functionality for those who want to make their skin smooth and remove wrinkles — tab "Spice." The skin on the forehead, chin and cheeks should be "smooth", in the locations of eyes, mouth, ears, hair and outlines of the nose — to increase the sharpness. Unfortunately, there is no way to change the size of the instrument, and with the increase in scale of the brush also increases. Therefore, a decent effect can be obtained only if the photo resolution is large enough. Tab, "Warp" will delight those who want to make a photo funny. You can stretch it out or flatten, tighten or shrink. For those who want to increase Breasts, ears or biceps, it is important to understand the sequence of the process, not to get distortion of the background. First you need to select the tab "Layers" and duplicate the layer. Then return to the tab "Finishing", to select tool eraser tool and erase the background on a layer. And only now, with a "Strain" to change the shape of various body parts. The same sequence will be convenient to change the background effects to make it black and white, contrasting or even shaded in a solid color. To remove one of the layers, select it and click Delete. In addition to these functions, developers have provided "Smart crop", "Cut" and "Repainting". They are designed for fast processing of photos by experienced users. Thanks to the detailed instructions to all functions, Evason photoshop" in the Russian language, to understand them, maybe a beginner. Overall, we can say that "Evason photoshop" is perfect for a small photo correction. To remove skin blemishes, smooth out wrinkles, to give the contrast of the picture, if you try to increase or decrease some part of the body. However, for those functions, which are traditionally famous photoshop, it is not suitable, for example, you cannot change the background, despite the possibility of working with layers. And templates cards, avatars, frames, unfortunately, are almost there. 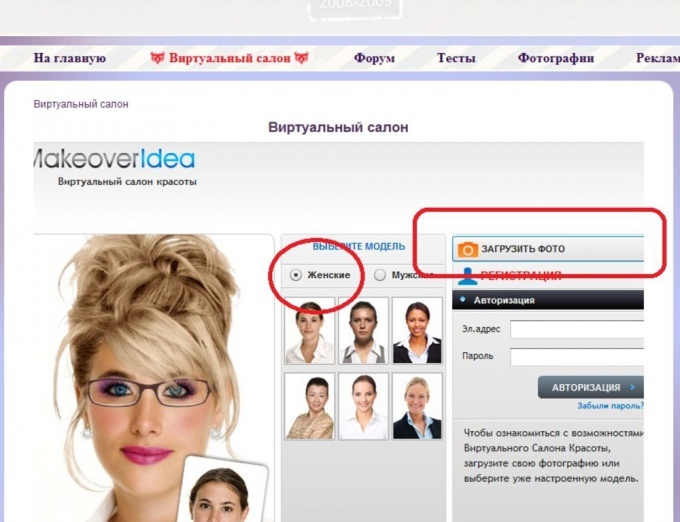 Its main and obvious advantage - you can use "Evason photoshop" for free and without restrictions.